hey ya’ll! i had every intention of blogging my backlog of projects before we went on our summer vacation, but alas. it wasn’t meant to be. probably because i was sewing like a madwoman up until the last day, as one does… MUST SEW ALL THE THINGS. i have several makes older than this combo, but i really like this particular outfit so i thought i’d start there. 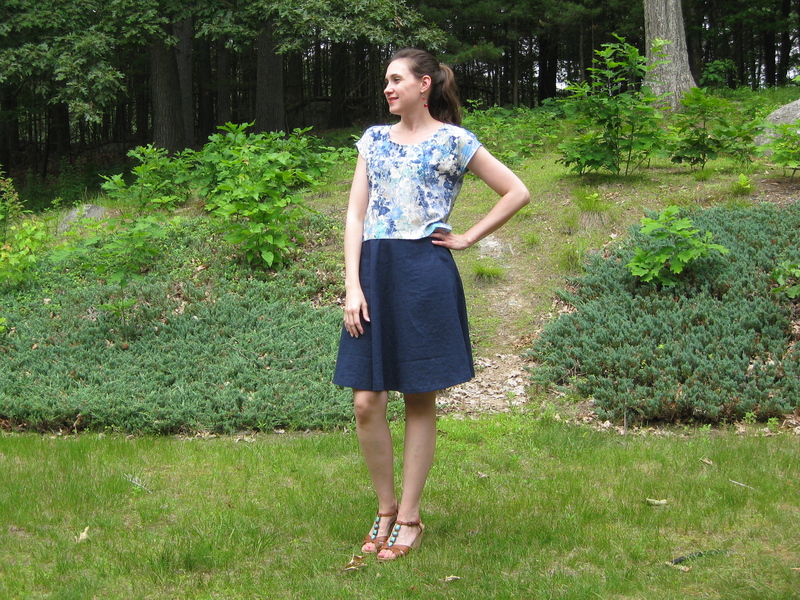 a few months back, i suddenly decided that i needed a navy linen skirt. and then couldn’t find any navy linen at my usual fabric haunts. then one day i ran into joanns for a zip/thread/pattern sale, and their linen was 50% off and they had the exact shade of navy i was looking for. this particular linen is blended with rayon, which gives it a nice soft hand. it also has a subtle woven pattern to it, which is a nice touch. having recently acquired the lonsdale dress pattern, i decided to use the skirt pieces and shorten them by 4″ or so. i top stitched every seam to add a little detail, and bar tacked at the top and bottom of the pocket openings. i wish the skirt had a little more flare, but overall i really like it and it fits in nicely with my wardrobe. i’m really itching to pair it with a nettie (preferably in a mint green…) definitely on my to do list! after making this skirt i made see kate sew’s zippy top. i really intended to alter my scout tee to have a kimono cap sleeve, but when Kate put up a sale on all her patterns a while back i decided to try it out. initially i cut this top to full length. when i realized that it would be a perfect match to my navy skirt i tried them on together and just loved the look. i wasn’t super excited about tucking the shirt in, as this fabric—though lightweight and gauze-y—has some body to it that made tucking a little fussy and unflattering. then i flipped up the hem to a cropped length and had a definite “ah-ha” moment. suddenly the crop top trend made sense! it helped that Sonja at gingermakes had just that day posted a crop top/skirt combo of her own, which nudged me in that direction. 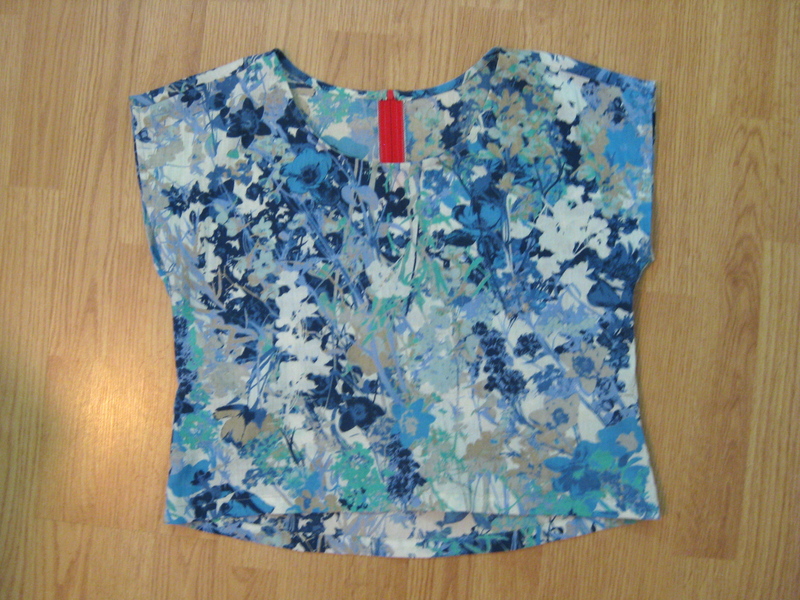 the crop does considerably narrow my options of what i can pair with this top, but i’m okay with that. i was nervous of over-cropping, so i went with a length in the front that is 1″ lower than the crop line in the pattern, and 2″ lower in the back. i think this worked out great, and i love the subtle sweep of the back hem. 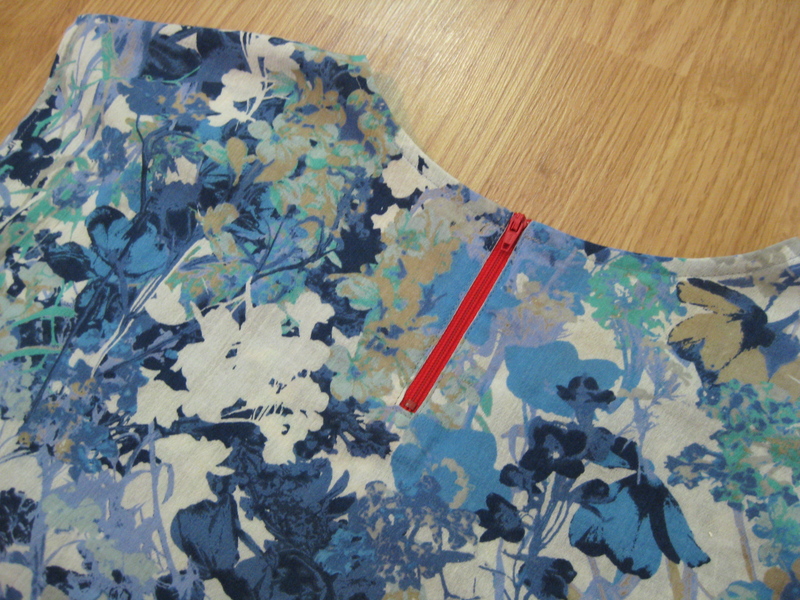 i actually didn’t plan on putting in the back zip, but as it happened i had a red zip on hand that kinda looked cool with the blue floral, so in it went. my fabric is a smidge see-through, so instead of the facing i did a bias facing at the neckline, and used a scrap to cut out the zip opening in the back. it’s a nice simple pattern to have around, and i plan on hacking it to make a simple pull over dress at some point. the actual pdf file gave me a bit of a head scratching when the file didn’t have any margin lines. i thought that was just a random printer error on my end so i asked about it on IG. kate did offer to send me a new copy, but i had already gone with my gut and worked it out on my own. being a pattern with so few pieces (and easily verifiable finished measures) i’m not terribly bothered. also, i didn’t see a test square anywhere. i can’t always assume that 100% scale actually prints the right size. our current (new) printer has been pretty accurate, but with the older printer we had a few months ago, i usually had to print at 106% to get the right scale. so, i guess what i’m saying is, i like the insurance that i am, indeed, printing the right scale. pdf issues aside, i found the drafting to be great. often on tops like this the front and back pieces are the same aside for the neckline. that’s not the case here, so i was pleased to see that. i found that it fit as expected, and next time i’ll do a SBA to remove some excess from the front, and maybe a FSA if i can be bothered. even though this is a very simple top, i’m okay letting someone else do the drafting work. it comes together super fast and would be easy to change up for color blocking, neckline changes, etc. i also find kimono sleeves ideal for layering with a cardigan—it’s far less fussy than trying to stuff a regular sleeve into a sweater.